Accessorising is my favorite part of getting dressed, I just love the way a few additions transform an outfit into a 'look'. A few weeks ago, I posted this simple outfit, back then teamed up with a few items of jewellry (enamel bangles, silver rings, and earrings made by a friend) an etoupe Picotin and the turquoise Brazil II Gavroche. Here's the exact same look, only replacing the Gavroche with a jumbo pearl necklace. It is such fun to play around, and to see how the swap of even one accessory creates a totally different atmosphere. It is also a great way to maximize one's wardrobe, especially when travelling. To compare, here is the Gavroche version from a while ago. To view the full post, please click on the image below. One outfit ~ several looks. Here's to the power of accessories! Definitely an ode to the power of the accessory, and to your style, my dear MT. Ravissant, et très chic! I thought about you when I heard from some family and friends in Paris, stuck because of the combined effect of the volcanic cloud and the SNCF strike. Here is to your lovely entries and joie de vivre avec style, and to your BDP Bolide, waiting to be picked up at the FSH. Each of your posts is a lesson on -and an ode to- elegance dear Maitai. Thank you for sharing. You're so right! I adore accessories because you can change the look of an outfit with the tweak of jewelry, scarves, handbags, etc. You always look so elegant. Thank you for sharing your wonderful style. I agree. They really change the entire look and they are fun to use. I think they can really stretch a wardrobe. Your style shines through whatever the outfit and accessories you decide to wear. For travel, I like to stick to a few separates and use scarves to add variety to the same outfits. (I admit, this is what I do even when I am not away from home!) Still, I like to travel with just a carry-on bag and scarves take up so little room and add such variety. I echo the wonderful words of ABGinDC! I hope you are not adversely affected by the volcanic ash and that the SNCF strike is soon resolved. Thank heavens your purchase awaiting you in Paris is not perishable and will, I trust, NOT have developed a patina before you retreive it LOL! Great reminder MaiTai... thank you as always. Love the jumbo pearl necklace. Lovely accessorising, MaiTai - it is true how little it takes to change a look competely! You look elegant and chic as always! I meant two different looks and not two different outfits. Sorry. Cheers to the power of accessories! You have such a wonderful way with them - just the right ones in fabulous combinations! I've always felt that those accessories around the neckline have the strongest influence on the overall look. You look gorgeous in both versions! I hope you and your dear ones are all right and surviving the air travel restrictions! Sending many good vibrations your way! ABG, booksnchocolate, Lulu, Manuela, Bonjour Madame, MiaT, dogbiskit, MaisieZ, Joanne, DD, hair-mess, SMR, sushi queen and JTandIS ~ it is always such a joy to read your kind and sweet comments, thank you ladies. With all your good wishes, I can’t see how I would not be able to pick up Ms Bolide very soon. Here’s to you, and to accessories! Lulu, here’s to you, from one accessory lover to another! Bonjour Madame, accessories are my fashion heros, and you are so right, they are a wardrobe miracle indeed. Joanne, I very much hope for sometime next week, fingers crossed! 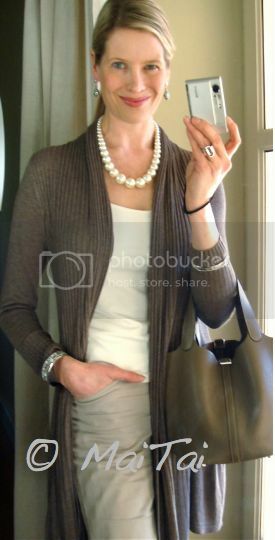 I love these jumbo pearls ... so chic!! !